With the current anti-alcohol tax regime, is it still possible to sell a bottle of wine at £5? Asda thinks so. They pointed me at a handful of recent Extra Special selections in their range in the £5-6 price bracket. Looking for something to go with fresh Yorkshire Spring lamb chops, I pulled out these two from the sample box. A 2010 Bordeaux at £5? An Aussie Cabernet at £5.95? Surely a price-gun error, or maybe a temporary discount? Asda assures me that this is the permanent price. Only one obvious conclusion then – it must be ropey wine. 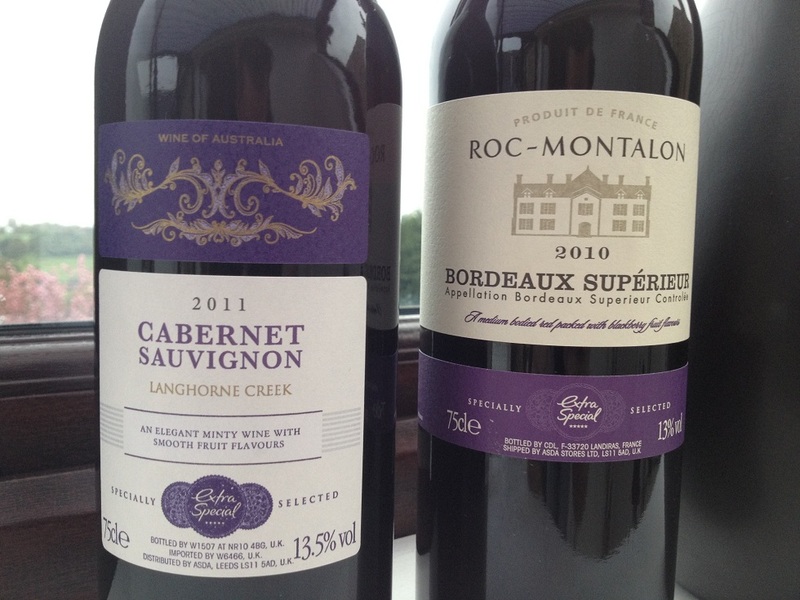 Wine one is Roc-Montalon Bordeaux Supérieur 2010. Smells a bit chemically and the taste lacks complexity. There is evidence of leaves and a lack of fruit but still somehow it is not unpleasant. At least the price doesn’t leave a bad taste in the mouth. Wine two is an Aussie Cabernet Sauvignon called “Langhorne Creek” from 2011. This smells of baked beans (well, it is a supermarket wine) and tastes just a little sharp, but nonetheless fruity and juicy, if just a tad Haribo. But here’s the thing. It’s really important to serve wine properly and if you put either of these into a decent (large bowl) glass, and if you serve at the right temperature (put in the fridge for about 30 mins before serving), they both taste so much better. Good gluggable party wines that you could easily serve to friends without any embarrassment. For the lamb chops, and probably in other circumstances, the extra 98 pence to buy the Langhorne Creek is worth the stretch. In these hard economic times, it is good to have somewhere to go to find wines that are drinkable and cheap. And both of these bottles fit the bill. A demonstration, I guess, of Walmart buying power.